More Thanksgiving and Autumn inspiration! We hope you’ve enjoyed IMAGINE Crafts’ product swap featuring the “Joyeux Noel” paper collection from Ruby Rock-It this past week! Today our Artist In Residence Eric Erickson bring you a scrapbook layout for inspiration. 1. Determine size of the frame opening based on the size of photo. 2. 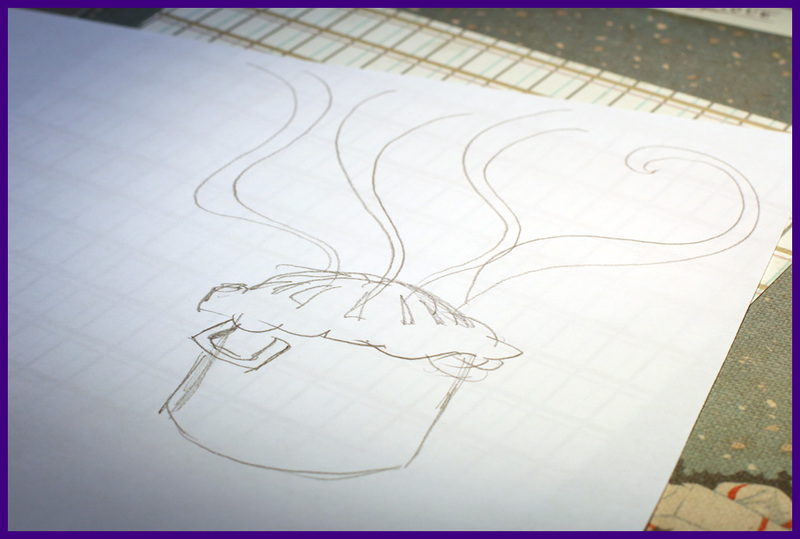 Draw the frame size onto the background paper and cut out where the photo should be placed. 4. Once all the shapes are punched out, organize them by shape, size and color so they will be evenly places over the layout. 5. Run the shapes through a sticker-making machine to get adhesive on the backs of them. 6. Begin placing the shapes over the background page and around the frame hole, evenly distributing the colors and shapes over the background. 7. Directly from the inker bottle, add a few drops of VersaMagic Jumbo Java to Creative Medium Vintage to darken the color. 8. Coat the Christmas-shape covered frame with the darkened Creative Medium with an InkBlusher. This will dull the colors of the punched out shapes and allow the rest of the layout to pop. 10. Place a piece of contrasting cardstock on the back of the frame and cut a thin mat around the edges of the frame. 11. Spray and cover the entire frame with GooseBumps Shimmer to give a glossy, textured sheen. 12. Stamps the page’s title with and Brilliance Pearlescent Thyme. 13. Use Brilliance Galaxy Gold to color the edges of the title card. 14. Adhere other Ruby Rock-It embellishments to the corners of the frame. 1. Select a neutral colored cardstock as the base for your layout. 2. Using a Brilliance Pearlescent Thyme Dew Drop, begin stamping directly to the paper in a triangular shape resembling a Christmas tree. 3. Add Brilliance Pearlescent Ivy over the Pearlescent Thyme to give depth to the tree. 4. Once the inks are dry, add texture with green Flower Soft. 5. For the other side of the layout, repeat these steps to create a Christmas wreath. 6. Take the Ruby Rock It Joyeaux Noel Bling and place them over the tree and wreath like lights. Since there is Flower Soft and inks that might prevent the bling from sticking permanently, use green thread to sew the bling strands on the page. 7. Place the tree and wreath on the layout with other neutral background paper. 8. To make a title pop off the page, outline the sticker letters with a Memento Espresso Truffle Marker. 9. Add photos and other embellishments to complete the page. Step 1 Apply Brilliance Pearlescent Beige ink directly to holiday stamp. Step 2 Stamp image directly on Ultra Smooth cardstock. Step 3 Apply VersaMagic Aquatic Splash with an InkBlusher to the edges of all patterned paper. Step 4 Using an InkBlusher, apply more Aquatic Splash ink directly to die cut inside die. Step 5 Remove paper from the die and apply Pearlescent Beige ink to edges of die cut for an antique appearance. Step 6 Apply Aquatic Splash ink directly to Monterey Pine wood piece. Step 7 Spray with Gold Sheer Shimmer Spritz. Step 8 Adhere card as desired. Step 1 Draw the shapes you want to create as handmade die cuts. Step 2 Draw the same shapes on the back side of Glistening papers. Step 3 Cut shapes from patterned papers. 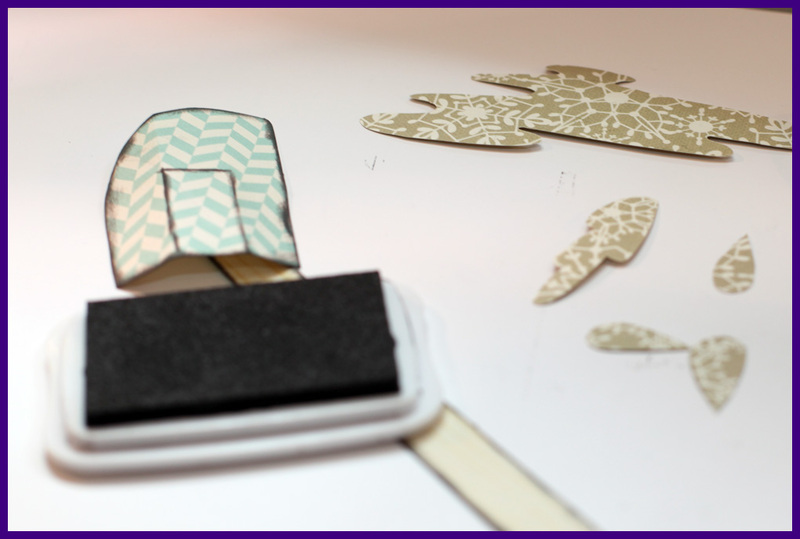 Step 4 Ink the edges of cut out pieces with an InkBlusher using Memento Luxe in Rich Cocoa and Gray Flannel. Step 5 To give the smoke pieces a shimmery and textured look, spray them first with Sheer Shimmer Spritz, followed by GooseBumps Shimmer. Allow to dry completely. Step 6 Create a frame that has a 1˝ thickness. Step 7 Edge the frame with Memento Luxe Rich Cocoa. Step 8 Spray frame with GooseBumps Shimmer and allow to dry. Step 9 Create a cardstock border for the frame (inside and outside). Step 10 Ink the edges of the frame with Memento Luxe Gray Flannel. Step 11 Using an InkBlusher, color the Monterey Pine Mittens with StazOn Teal Blue. Step 12 Spray GooseBumps Shimmer over mittens. Step 12 Begin placing the handmade die cuts onto the layout, incorporating pictures and sentiments into the layout. Step 13 Add journal entry with Memento Marker Tuxedo Black on “Glistening” paper. Step 14 Finish layout with other embellishments. Step 1 Laser print photos to transfer on high quality paper. Going to a copy center is the best option. Step 2 Cut out the pictures so they cover the entire wood piece. Step 3 Use a brush to coat the wood pieces with Creative Medium, and then adhere the copied photo to the wood. Step 4 After the adhesive is dry, use an InkBlusher to wet the paper. Step 5 Lightly rub off the paper until the image shows through on the wood. Step 6 Adhere wire to the back of the wood pieces. Step 7 Attach finished Monterey Pine embellishments to the page. Step 1 Cut six squares from the patterned paper, 4˝ each. Step 2 Randomly stamp snowflakes stamp on patterned paper with VersaMagic Jumbo Java. Step 3 Spray Fireworks Desert Sand over all the squares to give them a glistening glow. Step 4 Fold all edges of each square over ½˝. Step 5 Miter cut all of the corners of each square at a 45º angle. Step 6 Attach the edges of two squares with adhesive. Step 7 Continue this until all squares have been attached to form a cube. NOTE: pierce a hole in the center of the top and bottom pieces before attaching. Step 8 Wrap ribbon around the box, piercing a hole through the ribbon where the holes in the box are (top and bottom). Step 9 Push wire through the hole in the top of the box through the hole at the bottom. Spinning the ends into circles. Step 10 Curl ends of the wire to give a decorative finish. Step 11 Pull sheer ribbon through a crystal and finish with a bow. Step 12 Tie the ribbon with crystals to the bottom of the box. Step 13 Cover the holes in the top and bottom of the box with flowers and other decorations.